Slow Down To Do More: “How Walking Your Dog Could Change Your Day” With Ashley Graber and Leila Amirsadeghi. I create “breaks” for me time throughout the day. I have a dog and make it a priority to get 4 x 30 min walks in during business hours and I always leave my phone behind so I am present for my dog and able to let go. The walking helps clear my head and is its own form of meditation, the fresh air helps reset the brain and the exercise gets the blood pumping. As a part of my series about “How to Slow Down To Do More” I had the pleasure to interview Leila Amirsadeghi. As Chief Marketing Officer and Co-Founder of Onedome, Leila oversees Brand, Product, Marketing & Customer Experience, driving strategy across the company and its locations. She focuses on creating deep immersive experiences and new channels for artists to showcase their work. With over 20 years of building innovative digital products, creating award-winning marketing campaigns, launching new business ventures and strategies, and developing large-scale experiential and live events, she brings a truly holistic approach to the industry, telling a story that resonates and inspires masses. 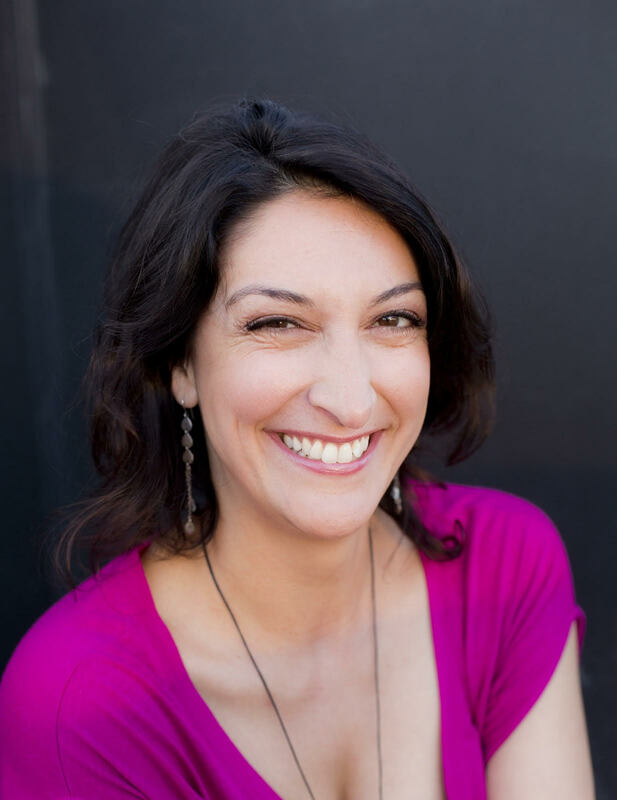 Leila has worked with some of the world’s most exciting brands and startups including Warner Bros, Xbox, Live Nation, Two Bit Circus, Netflix, Apple, Ready Player One, Sony, Disney, Microsoft, NBCUniversal and Google. Leila earned a Bachelor of Science degree in Investment & Financial Risk Management from City University Business School in London. Onedome is a manifestation of what I was looking for next in my life. Before I left my last job, I wrote down on paper what I wanted my life to look like and got very specific with the details, from how I want my day to be structured to the kind of work I want to be doing, the people I want to be working with and the impact that it can have. And what’s most beautiful is that Onedome is a convergence of all my passion points — Art, Technology Entertainment & Event Production. I have worked across Events, Technology, Digital, Marketing, Entertainment and Advertising. I cannot speak to how it’s been for others and only to my own experience. I believe that the feeling of “rushed” generally stems from feeling overwhelmed with too much on our plate. I know that I have a tendency to take on more than I should at times, or not respect my boundaries and agree to projects or tasks that I do should not take on, and I know that I am not alone in this. I do believe that our environment can play a huge part in feeling rushed, for example working in a fast-paced high stress company or living in a major city where everyone is functioning in this way. Absolutely. For one, not taking a moment and time for oneself leads to stress, illness and burn out. Not only is this something that I have observed in many around me, it is also something I have personally experienced many times, until I learned the importance of creating space for one’s self and in one’s day. Being rushed also leads to mistakes in work, missteps in communication and forgetting important things. When we are rushed, we are not present and that affects our relationships in love, work and friendship, when feeling rushed we do not give those we are around the attention deserved. It also prevents us from hearing others or for allowing others to hear us, or to see us. And of course, work product suffers tremendously as a result of feeling rushed. Our capacity and capability as humans is unlimited, it’s just we don’t know how to tap into our full potential. I do believe that mindfulness practices like meditation, breath work and spiritual practices can help us tap into greater parts of ourselves that connect to our creativity and our genius, and allow us to access a channel of knowledge and knowing that charts the course, generally successfully. Slowing down helps with communication, we can approach a situation from a place of compassion and love versus fear and judgement. We trust in ourselves and others, and are able to empower those around us to take on more as we remove ego from the equation and understand the value of collaboration. We can be better leaders and build better teams, and we can inspire others to do the same. Daily Meditation Practice — ideally twice a day but at minimum in the mornings. I practice Transcendental Meditation (TM), which is a very easy and forgiving meditation, one that allows you to maintain consistency. I tried many other types from Vipassana to guided until I found the one that worked for me. Take 15 out of each day to put words to paper — write about anything, stream of consciousness, not journal per se, just rambles…this always slows me down and gives pause to reflect. Creating “breaks” for me time throughout the day. I have a dog and make it a priority to get 4 x 30 min walks in during business hours and I always leave my phone behind so I am present for my dog and able to let go. The walking helps clear my head and is its own form of meditation, the fresh air helps reset the brain and the exercise gets the blood pumping. Start every meeting with a grounding — 2 min meditation to help everyone come into center and operate from the same place. Turn off email at 7pm (this does not always happen! Mindfulness is about being calm, grounded, present and unattached to the outcome. It is a state of just being. Being mindful opens our mind up to seeing all the possibilities. An example, as a human I may run up to a flock of birds too fast out of excitement and in doing so scare them away. As I take a moment to ponder what just happened and stand there still, quiet and calm, the birds come back. In my state of mindfulness I am able to make the connection between my actions and what transpired, and understand the effects around me. By taking a moment before speaking or responding. If I need to take a moment, I find a quiet place to practice a 5–10 minute meditation to bring my breath back to center. It’s about breathing more than anything. Implementing a practice in the company where you take a moment each day to appreciate each other and life. I feel that this is prevalent throughout my life, but most recently and as I mentioned earlier at the beginning of this interview, I manifested my company and my life today as a result of being extremely intentional. The old adage of “be careful what you wish for” does not stand true for me, why be careful? Wish for what you want and be very intentional about it. Care about and invest in education. In some parts of the world, a good education is free while in others like the United States, higher education like college, is a paid program. While online programs through educational organizations like EdX, General Assembly, and Khan Academy have made it affordable to get the knowledge needed for specific industries, there’s still a need to provide underserved communities the opportunity to thrive and evolve. This type of exposure to a solid education would bring about more diverse groups in a number of industries such a as Art and Technology and inspire new ideas!